1 of 4 Heat oven to 350 degrees F. Generously grease and flour two 9 x 2-inch round metal baking pans. 2 of 4 Stir together the flour, baking powder and salt in a medium-size bowl. 3 of 4 With electric mixer on medium speed, beat the butter in a large bowl until smooth. Gradually beat in granulated sugar until smooth and creamy. Add eggs, one at a time, beating well after each addition. Beat in the orange rind and vanilla. On low speed, beat in the flour mixture and orange juice alternately in 3 additions, beginning and ending with the flour, until well blended. Scrape batter into prepared pans, smoothing tops. 4 of 4 Bake in 350 degree oven 25 to 30 minutes, until wooden pick inserted in centers comes out clean. Cool cakes in pan on wire rack 15 minutes. Invert cakes onto rack; remove pans; cool cakes. 1 of 1 Place 1 cake, bottom side up, on platter. Brush with syrup. Spread with whipped cream. 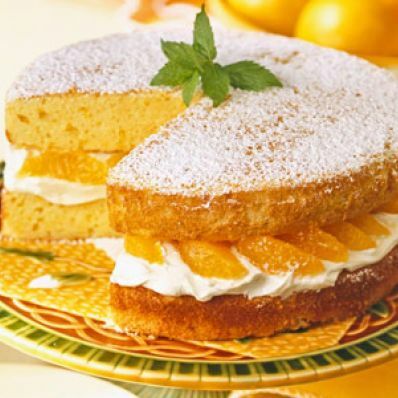 Arrange orange sections in circular pattern on top of whipped cream. Place second cake, bottom side down, on top of orange sections. Dust top with confectioners sugar; garnish with mint. Makes 16 servings. Per Serving: 1 g fiber, 11 g sat. fat, 114 mg sodium, 359 kcal cal., 102 mg chol., 19 g Fat, total, 44 g carb., 4 g pro.